Slide Rock State Park, originally the Pendley Homestead, is a 43-acre historical apple farm located in Oak Creek Canyon. Frank L. Pendley, having arrived in the canyon in 1907, formally acquired the land under the Homestead Act in 1910. Due to his pioneering innovation, he succeeded where others failed by establishing a unique irrigation system still in use by the park today. This allowed Pendley to plant his first apple orchard in 1912, beginning the pattern of agricultural development that has dominated the site since that time. Pendley also grew garden produce and kept some livestock. The park is named after the famous Slide Rock, a stretch of slippery creek bottom adjacent to the homestead. Visitors may slide down a slick natural water chute or wade and sun along the creek. 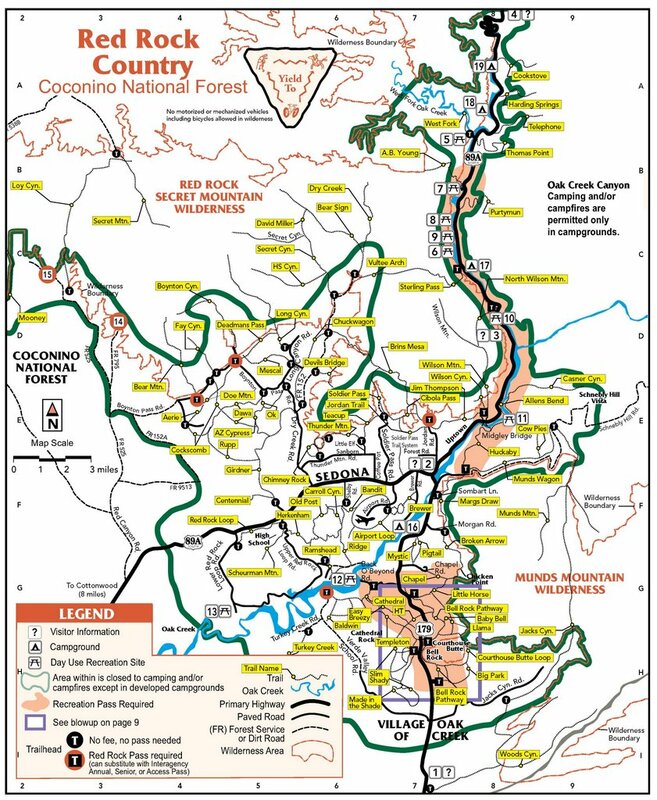 The swim area is located on National Forest land which is jointly managed by Arizona State Parks and the U.S. Forest Service. Together these areas have seen the making of many Hollywood movies such as "Broken Arrow" (1950) with James Stewart, "Drum Beat" (1954) with Alan Ladd and Charles Bronson, "Gun Fury" (1953) with Rock Hudson and Donna Reed, and a scene from "Angel and the Badman" (1946) with John Wayne. On July 10, 1985, Arizona State Parks purchased the park property from the Arizona Parklands Foundation. The park was dedicated in October 1987, and accepted onto the National Register of Historic Places on December 23, 1991. 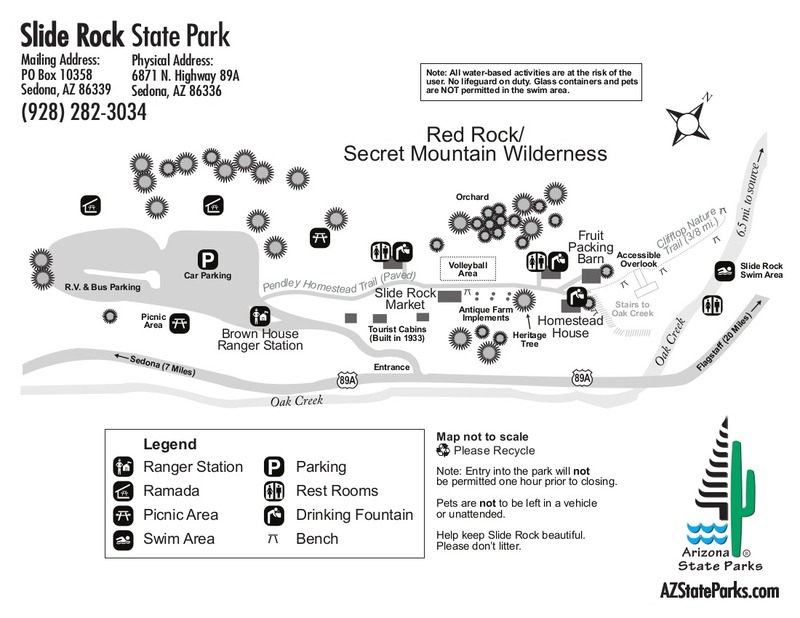 The weather at Slide Rock State Park is similar to that of Sedona. The elevation is almost 5,000 feet. For an ideal summer visit, bring your bathing suit, towel, plenty of sun block, a trash bag, and shoes to protect your feet. In the winter be sure to bring your camera to capture ice on the rocks and a pair of binoculars to enjoy the birds. 0.25 mile trail with a difficulty rating of easy. This paved, level trail is suitable for all visitors and travels through a portion of the historic Pendley Homestead of Slide Rock State Park. Features along the trail include some of the original apple orchards, Pendley Homestead house, tourist cabins, apple packing barn, various farming implements that were used historically in the homestead, a new orchard of semi-dwarf apple trees, and spectacular views of the canyon walls of Oak Creek Canyon. This is a 0.3-mile trail with a difficulty rating of moderate. This primitive route along Oak Creek is the main access to the Slide Rock Swim Area. This is extremely popular area features a natural water slide along Oak Creek. This is a 0.25-mile trail that begins near the apple barn and offers scenic views of the Slide Rock Swim Area.